Many of us walk though life with a chip on our shoulders or an attitude that life has dealt us some pretty hard knocks. We feel sorry for ourselves and look for pity from our fellow man. Just one visit to this lovely woman's site will change that attitude for many of us. This special lady chose not to dwell in self pity, but to turn her terminal illness into something positive and she courageously displayed it for the world to see. It is my belief that Missy chose to do this to help make us understand that what we have is precious... life. She is trying to convey to us not to take our lives for granted as so many of us do. To live each day to the fullest because we never know what tomorrow will bring. To love and respect our fellow man regardless of color or creed and through that love and respect, help our fellow man when he is in need. I believe she is trying to convey the message of love. Not only to love our fellow man but to love our children as well and to guide them wisely so they know the correct path to take into adulthood. And just as importantly to love ourselves. If we love ourselves, we will be loved by others. If we love ourselves, we won't abuse our bodies with drugs and alcohol. She has taught us that even when our bodies are so weak that we can barely move, we can still be the strongest of men. When we are too weak to speak, we can still convey to the world that we should be striving for peace and unity among all nations, of all people. Missy, these thoughts are what I read in your pages. I've been wrong many times in my life but I don't think I am wrong now. For your wonderful pages I thank you. I truly believe that they have been an inspiration to more people than you could ever have imagined. 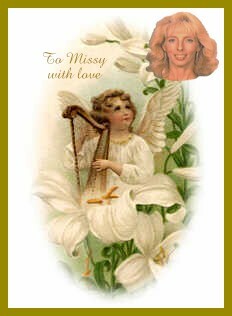 You are in our thoughts and prayers Missy. God Bless You. Song playing is "There is Love"